As y'all have probably seen through blogs and photos recently, WIA 2014 just came to a close after a jam packed weekend. This was our first show to attend, and we are already looking forward to many more! 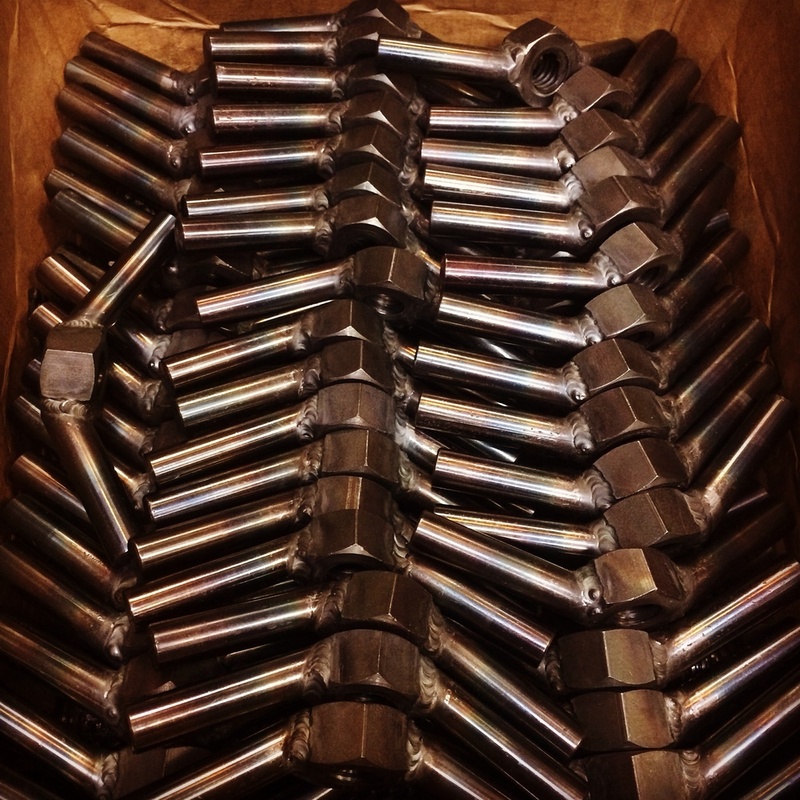 We nearly exhausted our inventory of aprons, tool rolls, and vise kits at the show. That's a good thing! On the flip side, we now need to spend some time building it back up. Our website also needs some tweaks to handle new products and a more streamlined user interface that we have planned. Because of this, the General Store will be down this week as we work feverishly to bring it up to date. Because of the great response from WIA, we hope to have it up and running at full capacity by this coming weekend. Any and all updates will be first mentioned on this blog, so stay tuned for updates. We are looking forward to the exciting times ahead. We will be at Handworks 2015 and at other shows through the state of Texas. I look forward to meeting lots of new friends and saying hello again to friends we've just made. Well that was an exhausting time in North Carolina! In a whirlwind of a weekend, new friends were made, new ideas tossed around, lots of beer consumed, and exciting things were planned for the future. After all of the dust settled, we feel even better about being a new part of this tight knit woodworking community. We were fortunate to share a large booth with Sterling Tool Works and Walke Moore Tools, both quality makers with the highest of standards. 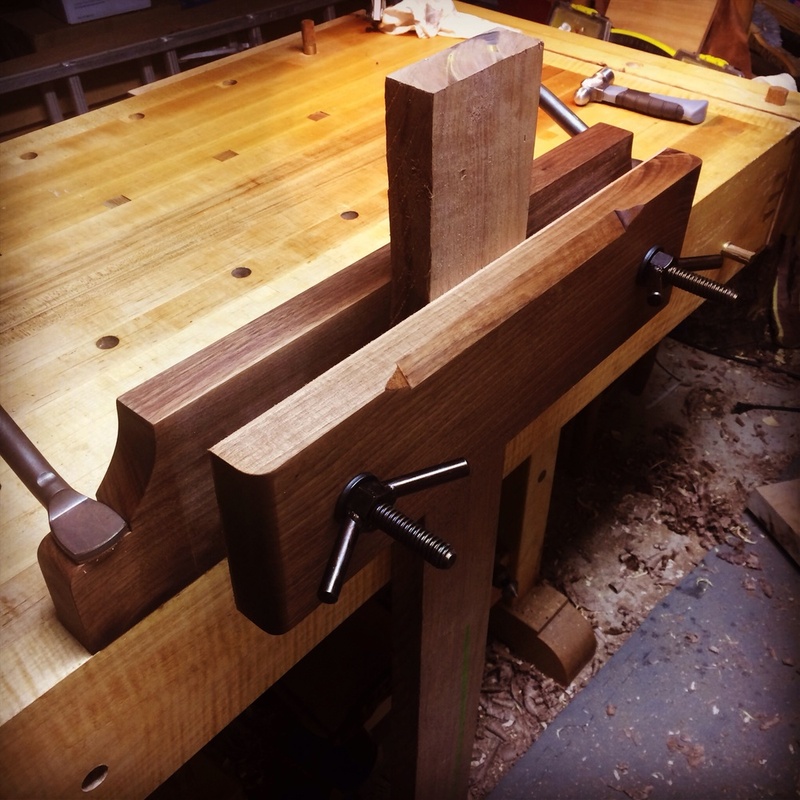 I was privleged to assist Mark Hicks of Plate 11 Bench Company assemble his latest Split Top Roubo with the brand new Benchcrafted Glide leg vise hardware. Mark's attention to detail was readily apparent as I inspected each component, inside and out. Before we attached the top, he pulled out his Lie Nielsen bronze smoother and went over every surface, not satisfied until every face was show room quality. The Benchcrafted hardware was something to behold. Anyone in need of a quality vise should look no further. Anyone in need of a quality bench need not look any further than Plate 11. I can personally attest to the quality and potential of their benches. The crowds were great, a lot of excited people who were interested in every aspect of woodworking. They were attentive and enthusiastic, asking lots of questions and showing a lot of interest. My saw vise prototype was a big hit, drawing a crowd almost everytime I set it up. Drawing a crowd as I demonstrate our Saw Vise prototype. 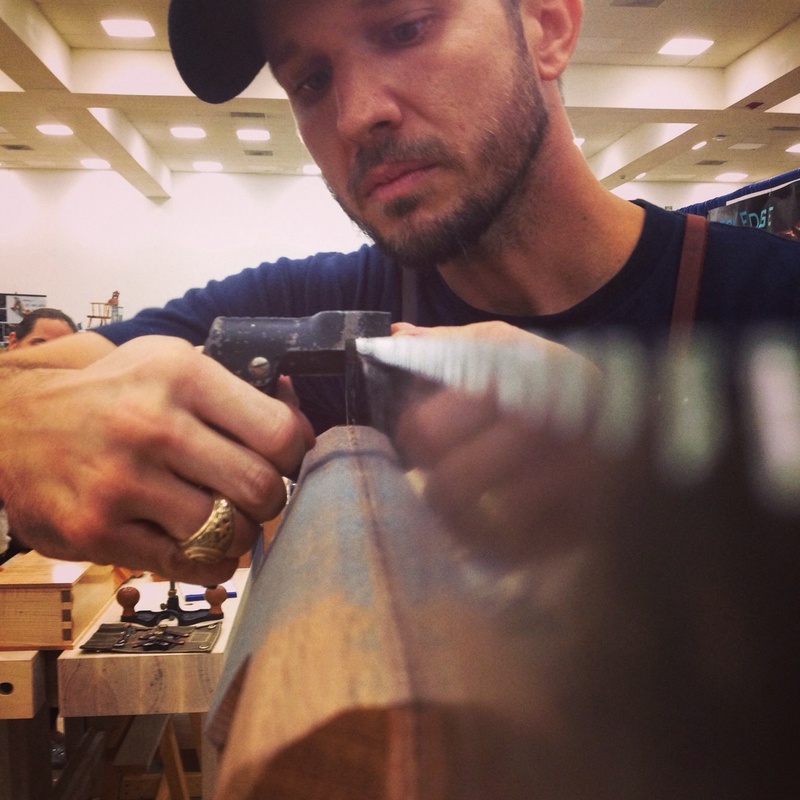 Matt Cianci of the Saw Blog was in attendance and stopped by Friday to see the vise. He had some good advice and was a really positive person to talk to. The support for the small maker was evident day in and day out. Everyone from the attendees to the tool making veterans did all they could to make us all feel welcome. This community is something else! Discussing the finer points of Saw Vise construction with Matt Cianci. At the end of the show, I restored the tooth line on a Disston rip saw that belonged to the grandfather of a good friend. The tooth line was concave, resulting in a blade that bound up with every stroke. After milling a slight crown, I reshaped and sharpened all of the teeth. The saw that came to me in sad condition left in wonderful shape, ready for another century of service. Setting the teeth with a Stanley 42x saw set. The highlight of the entire show was the hand tool corner, dominated by the Instagram community. We came in force, and we made a solid impression! It was great getting to meet so many talented and wonderful people. I feel like I've known them all for so long, it was great to further the friendships over such an amazing weekend. With such renowned makers such as Peter Galbert, Marco Terenzi, Scott Meeks and Caleb James on hand, there was no shortage of talent. The best part is the every single person was more than willing to share every bit of knowledge they had, answering every question and demonstrating every technique. I learned more this last weekend about woodworking and toolmaking than I have in the last year. Also in attendance were a nice collection of aprons I've made. Nice to see them all after a bit of use! We even had an impromptu jam session with Caleb James, plane maker and Anne Briggs of Anneofalltrades! The two Ambrosia Maple guitars made by David Bradley were quite a sight to see! All in all, it was a great experience. Much more than I could have ever imagined. I was sad to leave, but excited I was able to attend. It seems most of our group will be at Handworks 2015 in Iowa this May. That just can't come soon enough. I just finished up two new aprons, and updated a third, for three well known tool makers in the woodworking industry. It was a pleasure working with each one of these guys. They have the same mindset as I do, if you're gonna build it, build the hell out of it! Their products are top of the line and I'm honored they chose to work with me when it came time for their custom shop aprons! Mark Harrell, of Bad Axe Tool Works, commissioned my first waxed canvas apron. We went with Olive Drab in honor of his military career and embroidered his logo one of the lower pockets. The color combination on this apron is fantastic! Stop by the Bad Axe booth at Woodworks Conference 14 in a few weeks and see the apron in person. And maybe buy a saw or two, you won't regret it! I also just finished a custom apron for Scott Meeks of Scott Meeks Woodworks. Scott handcrafts some of the finest wooden planes available today. His style is unique and really stands out. 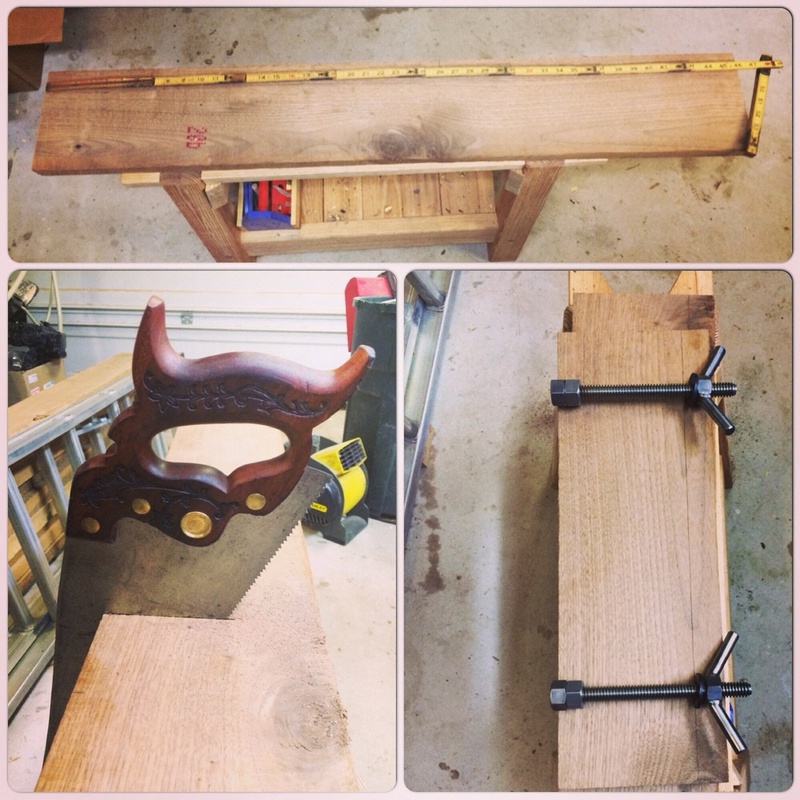 He is currently working on a Mesquite Jack Plane for me, can't wait to see it! His apron included a utility ring and a custom designed plane hammer loop for his Sterling Tool Works plane hammer. The double loop configuration keeps the hammer close to your side, keeping the beautifully made walnut and brass masterpiece out of harms way. 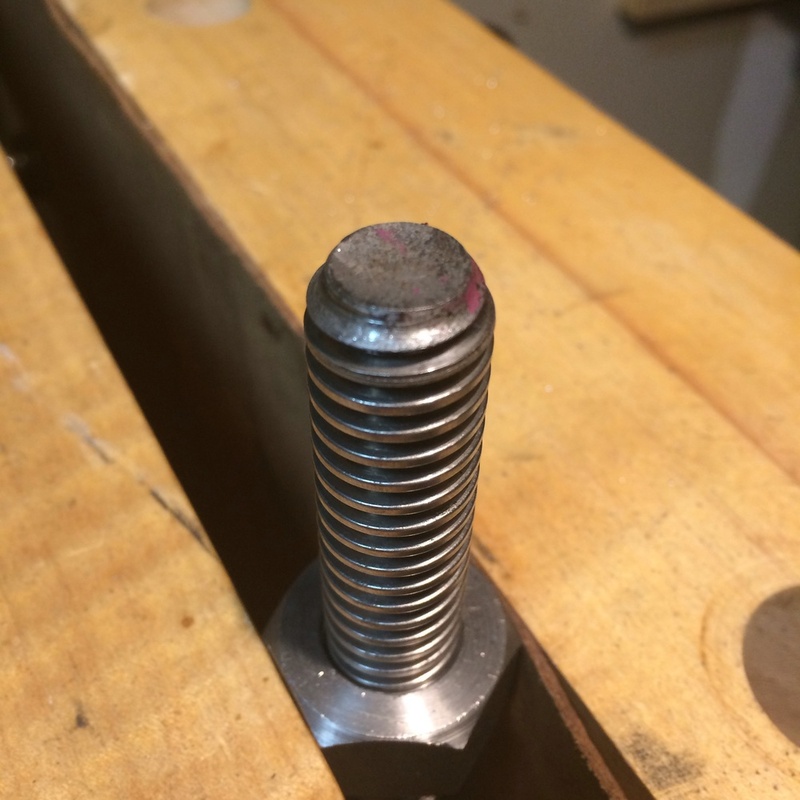 If you are in need of a plane adjusting hammer, look no further than the one made by Chris Keuhn of Sterling Tool Works. I can personally attest to the craftsmanship and utility of this hammer. It just so happened that while I was making these two aprons, I also had Chris' apron in for some updates. Since I made his apron back in January, I've changed a thing or two. He sent it back in to have a label sewn on and to have the shoulder strap adjustment upgraded to the current setup. It was quite an honor to have all three Maker's aprons in my shop at once! Come by booth 621 at Woodworking In America next week and see our stuff and say hello! Sterling Tool and Scot Meeks Woodworks will be there too, as well as a large group of talented tool makers. It's gonna be great! We've been so busy prepping for WIA, I completely forgot to cover the #handtoolthursday posts from the last three weeks! I'm a slacker, but I promise the products at WIA will be worth it! 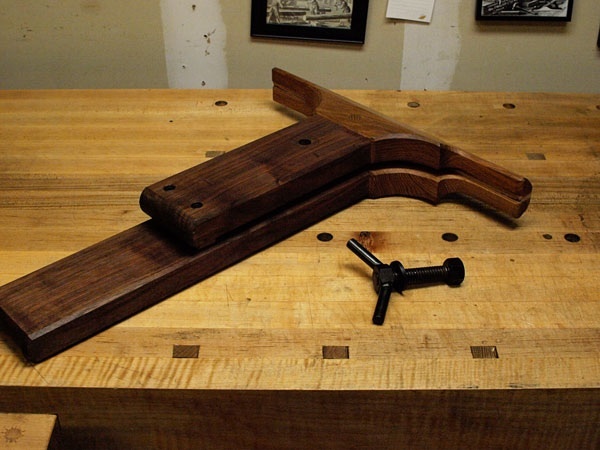 Here is a look back at my last few weeks of #handtoolthursday posts. I'm proud to say that with each successive week, the contributions almost double over the previous week. We are up to over 700 total posts on Instagram alone!! It's starting to cross over into Facebook and Twitter as well. Let's keep the momentum going strong! Here is a set of 19th century blacksmith made dividers. I picked these up in a large craigslist score a year ago. I use them on almost every job I perform. Next up is my prized Stanley 66 beading plane. Almost all of the nickel plating is intact. The moveable fence is still there as well, along with the original Sweetheart blade. This 24" Starrrett level was part of the same craigslist score in which I picked up those dividers mentioned earlier. About 85% of the japanning remains. It has some patina, but is still straight and true as the day it was made. Since the last few weeks have been crammed with WIA prep work, it was only fitting that one of my posts involved my Moxon Hardware kits. Here are 32 kits boxed and ready to be shipped off to North Carolina. Damn things are heavy! And last, but not least, a comparison shot of a Stanley #5 and my newly acquired Clifton #5. Only time will tell how well this Cliton plane will work. If it's fit and finish are any type of indication, this plane should be a worthwhile addition to my tool collection. I will be bringing it to WIA, so stop by and make some shavings with us! 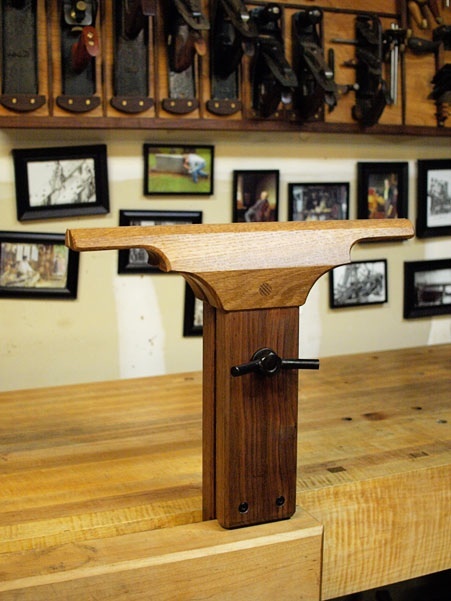 Next #handtoolthursday falls on the setup day for WIA. I'm sure there will be some interesting pictures getting posted that day! I look forward to seeing them all!! New and Improved Nail Aprons! After a little wearing around the shop, I decided to make a slight change to the Nail Apron. The hammer loop just wasn't as versatile as it could be. I knew I could make it better, so I set out and did just that. The hammer loop has been relocated and redesigned. Made to accommodate larger hammers, it expands the versatility of these aprons. Now they can be equally appreciated by cabinetmakers, upholsterers, weekend handymen, or gardener. Moving the hammer loop to the side also opens up another pocket on the right, perfect for a utility knife or folding wooden rule. The Nail Apron is now better than ever, and still at the same price of $85. As soon as we get back from WIA, we will start making the next batch of Nail Aprons in Olive Drab, Field Tan, and Charcoal Grey. Sign up below to get on the preorder list. A sign up form will also be available on our home page. Those on the list will get first crack at the Nail Aprons. Once we are ready to start production, invoices will be emailed to those on the list. 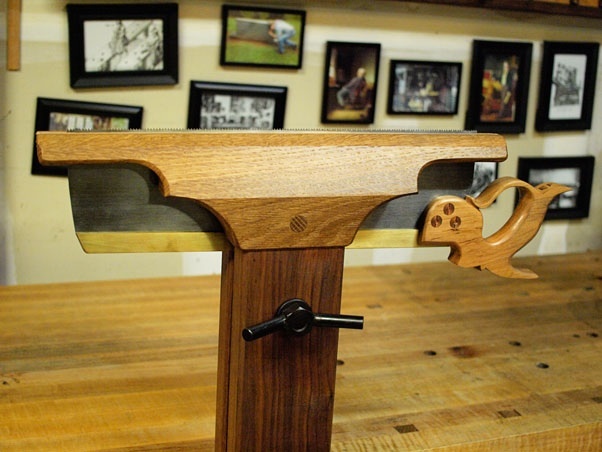 Come get one at Woodworking In America or sign up to reserve yours now! Half Aprons/Nail Aprons ready for WIA! Texas Heritage Woodworks is excited to announce our latest addition to our apron lineup, the Half/Nail Apron. Designed with the Joiner and Cabinetmaker in mind, this versatile apron can be used in countless applications. Construction of durable 14.7oz waxed canvas and leather, all components are held together securely with copper rivets and double stitched seams. Originally intended as a companion with the use of cut nails, I've quickly discovered just how well this apron crosses over to other disciplines. The waxed canvas construction is ideal for outdoor use. The two main pockets are deep and roomy, while the loop on the right provides a convenient location for a hammer. The real versatility of this apron is found in its left pocket. There is plenty of room for a notepad, steel rule, pencil, and a nail set. Or, fill those slots with your upholstery tools, layout tools, or whatever else you need at the ready. There will be around a half dozen of these aprons available at Woodworking in America in this beautiful Olive Drab canvas with brass hardware. The price is $85. Stay tuned to this blog for more updates and pricing info. As products and pricing are finalized, they will be posted here. Laying out pocket divisions with dividers. Texas Heritage Woodworks featured in Furniture & Cabinetmaking magazine! I am both honored and humbled to have our shop aprons featured in the May 2014 issue of Furniture & Cabinetmaking magazine, a UK woodworking publication. 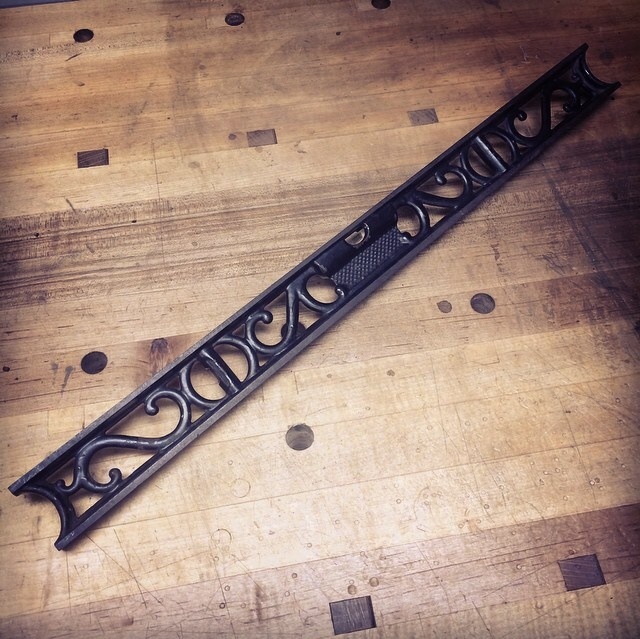 Derek Jones, editor of Furniture & Cabinetmaking found my work through Instagram. He has been a huge supporter of our work and I can't express my gratitude enough for his help! I stopped into the local Woodcraft store this past week to purchase every issue they had available. It was a CRAZY experience! People were shaking my hand, patting me on the back, congratulating me over and over. I felt like a mini celebrity! They even took my photo and emailed it out to their entire email list! Things are really looking up here at Texas Heritage Woodworks. Exciting times, that's for sure!! And it's all due to the fierce and loyal support of the International woodworking community. What a wonderful world we live in!